I am not focusing on the indicators yet but only on the viz. And of course, I want it all in the same viz (not a dashboard). I can easily create a Position 1 and a position 2 for the first part using table calculation with specific configuration. 2) Create the curve showing the first step. But when I try to build the second part, I encounter a strong issue. Since my data should be sorted regarding a hierarchy using the 3 dimensions, the second part doesn't show properly (I have to include the 3 levels in the details, which really doesn't show the data properly). I have tried every configuration in the table calc parameters for position 2 bis and position 3 but I really can't achieve the view. Does anybody have an idea ? I enclosed my working workbook ! I've built a few "Dendrograms" in D3 for fun, although it's been awhile. It appears to be exactly what you're trying to do. I wonder if the logic from the underlying script used for building it could be interpreted in Tableau in some way. I'm guessing there will be some heavy data pre-processing used before the data is brought into Tableau, probably more complex then the Sankey. I built this a few weeks back for someone in Zurich, Switzerland in an effort to duplicate a chart done in D3. 2.) For level 1 I used t from -6 to 6 then for level 2 I used 6 to 12 and for level 3 I used 12 to 18. This allowed multi-level connections. 4.) Swapped Axis to get the tree to go down instead of across. I will post this workbook once I convert it to anonymous data (the original workbook is proprietary). This looks great Jeffrey ! Basically, that's the approach I am using ! But I am still trying not to reshape the data. How far do you go in the data reshaping to achieve such a viz ? I manually did the shaping of the data for this viz, but you should be able to use this method to avoid shaping the data. I am very familiar with this Jeffrey... The question is regarding the position of the nodes on the Y axis. I easily managed to dynamically generate the Position 1 and 2 in the Polygonic Sankey. I basically want to do the same with the decision tree. But it requires to have all the fields from the hierarchy in the details... and I don't get a proper grouping at the node level. Looks like I achieved it myself with no data reshaping ! and in a single worksheet ! Solution to be published soon ! Wow Olivier CATHERIN can't wait to see how. While waiting for the full description, here is the workbook ! Wow. Amazing. I should get my hands on the workbook and start playing. Do you have to reshape the data to gwt that view? Amazing work..
No data reshaping ! It just require to add a "Link" Column in the dataset and blend it with an advanced version of the data developed by Jeffrey Shaffer in order to draw the polygones. The viz can still be optimized a bit by grouping the flows in a single polygone at each level (i.e. 1 polygone per order priority at the first level ...). I will take advantage of the christmas holidays in order to write a step by step how-to. Re: Create a simple decision chart? Re: Below Chart. How it can be done. 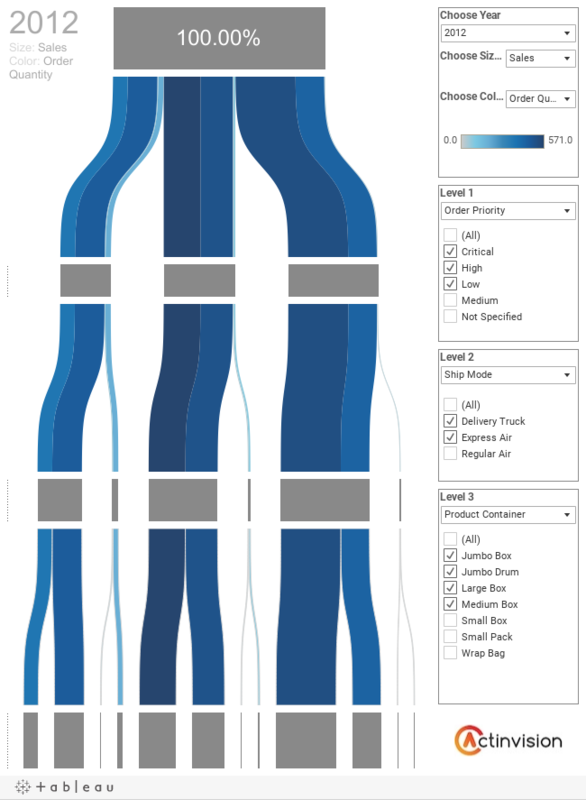 Re: Is there a way to design a multi-channel contribution graphic (if that's how they get called:-) in Tableau? Re: how to create a work breakdown structure (WBS) in Tableau?